Please join us for an amazing opportunity to participate in a walking food tour of LA's Thai Town led by celebrity Chef Jet Tila at 11am on Saturday, March 7, 2015! This LA native and culinary storyteller was appointed the official Thai Culinary Ambassador to the United States by the Royal Thai Government. He completed his education at Le Cordon Bleu where he established a framework of classical French technique to match his extensive knowledge of Asian cooking. He is a highly sought-after consultant in the Pan-Asian dining niche, hosts his own radio show on KLAA Los Angeles and is a regular judge on the popular TV show Cutthroat Kitchen. You can find additional details at http://chefjet.com/. Chef Jet offers Melting Pot Food Tours of Thai Town at the cost of $125/person. However, in collaboration with and in support of TABA, Chef Jet is offering his tour to TABA members at the significantly reduced rate of $60/person!! For this reason, space is extremely limited. Only current TABA members may participate in this event. So please renew or apply for TABA membership using the form available here before you RSVP. 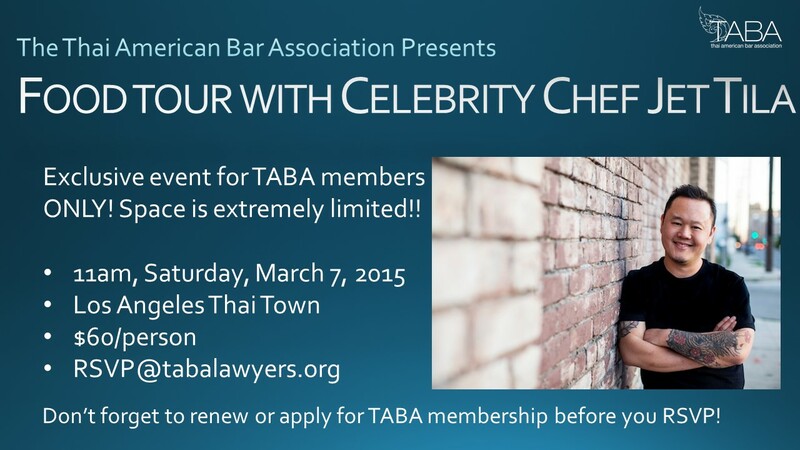 You may RSVP for the Food Tour by emailing RSVP@tabalawyers.org. Space permitting, we will confirm your spot by February 21, 2015.